Bob Dylan’s work with The Band has become the stuff of legend. They famously recorded a joint album, The Basement Tapes, in 1967 and 1968 at Big Pink and other locations in Woodstock, N.Y. (where Dylan at The Band were living), but the album wasn’t released until 1975. After Dylan suffered injuries from a motorcycle accident in 1966, he quit touring for seven years and reemerged on the live scene for a two-month tour with The Band in 1974. On this day in 1974, Dylan and The Band performed at Oakland Coliseum and demand for the show and other dates on this tour was massive. In fact, it was so massive that the U.S. post office had to set up extra mailboxes for ticket orders in many major cities. Dylan and The Band performed 40 shows in 43 days, concluding with three performances in Inglewood, California, where the majority of the live album, Before The Flood, was recorded. The lineup for the tour consisted of Bob Dylan (guitar, piano, vocals, harmonica), Robbie Robertson (guitar, vocals), Rick Danko (bass, fiddle, vocals), Richard Manuel (piano, vocals, drums), Garth Hudson (organ, clavinet, piano, synthesizer, saxophone) and Levon Helm (drums, mandolin, vocals). Highlights from that night in Oakland included a revamped version of “Lay Lady Lay,” a Jimi Hendrix-like rendition of “All Along the Watchtower” and favorites like “The Times They Are A-Changin’,” “Highway 61 Revisited” and “Like a Rolling Stone.” As the crowd demanded an encore, Dylan put on spirited performances of “Maggie’s Farm” (which had only been performed on three other occasions on this tour) and “Blowin’ In The Wind,” which was performed electrically rather than the traditional acoustic version. 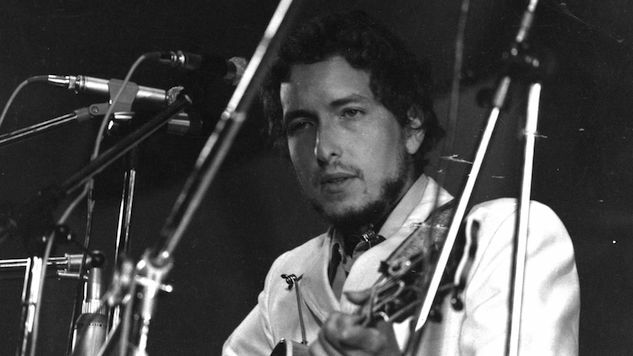 Listen to Bob Dylan and The Band perform on this day in 1974 below.